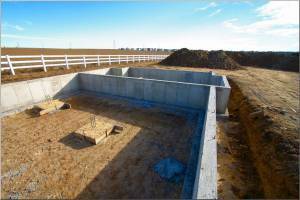 Follow these articles when planning to work with concrete! If you are building a shed, garage or other wooden structure on a concrete pad it is important that you properly anchor the structure to the pad to avoid having it blown apart or away by high winds. 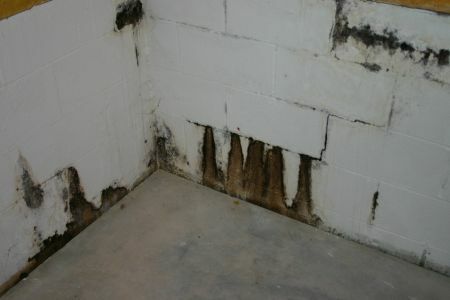 Water leaks or seepage in your basement will damage stored items, destroy finished walls and flooring, but more importantly it becomes the perfect breeding area for mold. Where there is mold, there is the possibility of reparatory problems, allergies and odors. These contaminants will eventually permeate throughout your home. 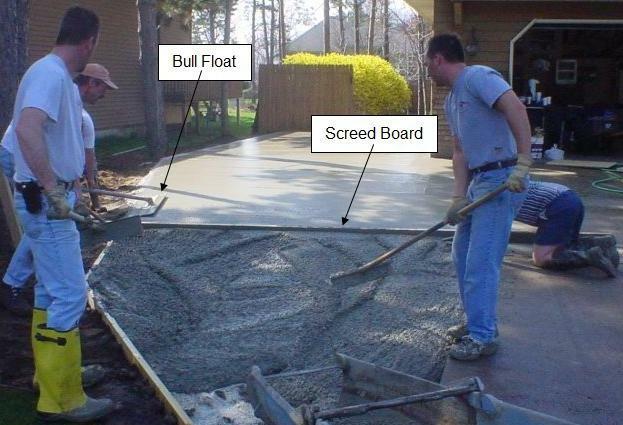 If you are planning a home improvement project that calls for concrete such as a patio, deck or garage it is important that you understand the basic terminology used by the industry. Anytime that you need to fasten something, be it racking, cabinets or other objects to a wall, floor or ceiling made from concrete you must consider the best method to anchor it. One of the most common errors made by the diy home handyman is to look in his glass jars to find a fastener that might work. After spending countless hours and dollars on a home improvement project skimping on the fasteners is foolish to say the least. 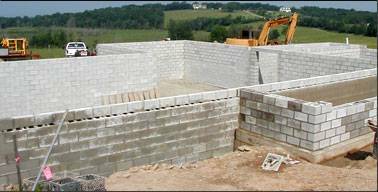 If your diy home improvement project requires construction material that is economical, does not burn, reduces the transmission of sound, is termite proof and will never rust or rot then you should consider the use of concrete blocks. 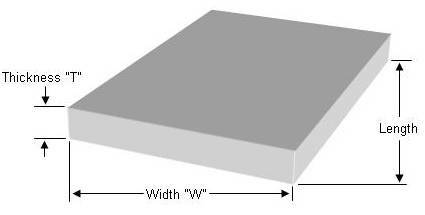 Figure 1 shows concrete blocks used for basement walls. Building your own concrete slab, patio driveway or walkway is an excellent home improvement and most diy home handymen are capable of completing this type of project. All that is required is some knowledge and the right tools. Clean-up oil and grease from concrete in your garage or driveway and avoid tracking it into your home using this homemade concrete cleaner. One of the newest materials to be used for countertops in the residential kitchen and bathroom new home and remodel market is concrete. The vast majority of concrete patios are basic slabs of concrete that have been finished with a relatively smooth surface. Pouring the concrete to create a slab is only half of the project. 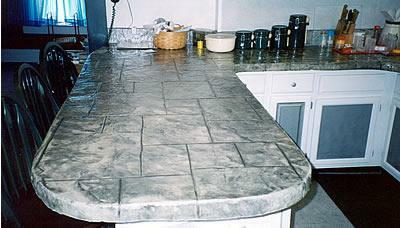 Once the concrete is poured into its forms, it needs to be worked to a level and smooth finish. As with many diy home improvement construction projects, what you don’t see is more important to the finished project than what you do see. The preparation of the sub-grade when pouring a concrete driveway is critical, without it, the life of the driveway will be decreased dramatically. Although concrete is one of the most durable products made, overtime, normal wear and tear, the elements, inclement weather, freezing and thawing can cause the surface of the concrete to become damaged. There are many surface problems that can happen to concrete; scaling, cracking, dusting, spalling, discoloration, popouts and efflorescence. 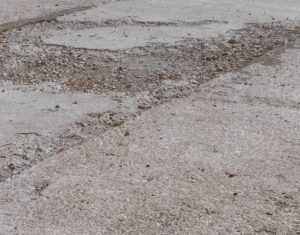 When the surface layer of the concrete is coming off it is known as delamination. Decorative concrete as a home improvement project, requires some expertise and may be a more complex project then most diy home handymen are willing to undertake. 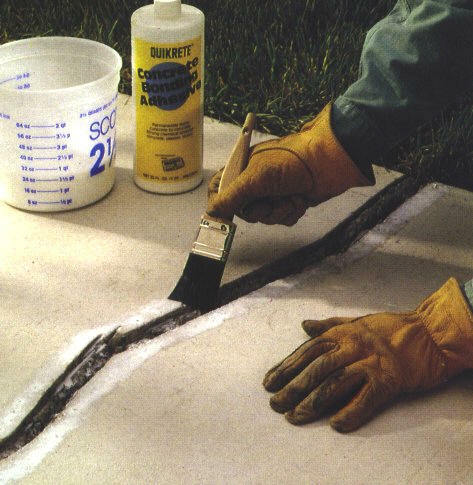 This information pertains to repairing cracks in concrete slabs such as patios, driveways and floors and walls. 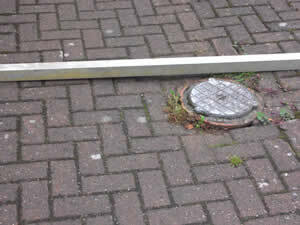 Most diy home handymen are quite capable of implementing these repairs. 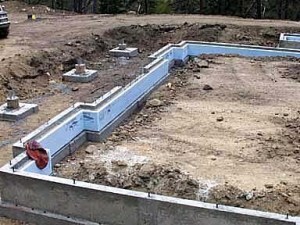 The foundation is the part of a building that supports the load of the house. In construction the term foundation generally applies to all of the building segments that are constructed beneath the framing of the first floor including all of the walls, piers, columns, pilasters and other supports. These pages identify and provide solutions to many of the problems typically seen in the foundations of newly constructed houses. The solutions provided represent the better design and building practices being applied by leading builders and the best practical advice being offered by building researchers, professional associations and the home building industry. Winter time can bring the back breaking task of shoveling snow from your driveway just to be able to go to work. Ice can be a serious hazard and using ice melting chemicals is costly can destroy walkway and driveway materials, the landscaping around the driveway and can be tracked into the house, damaging floors. 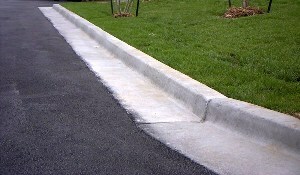 The value of concrete curbs and gutters along the length of a driveway seems to be a mystery to many homeowners and because of this, many asphalt driveway installations do not have curbs and gutters installed along their length. 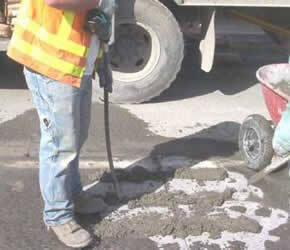 Blending the mixture of gravel, sand and cement is one of the keys to producing a good concrete. 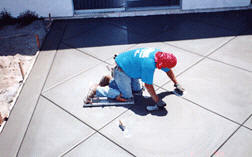 Painting concrete provides a clean, fresh appearance. 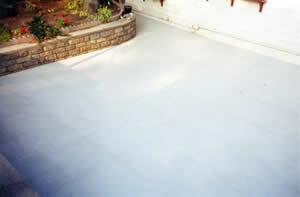 Painted concrete is easier to clean, spills wipe-up easier and the paint provides a level of protection to the surface. As with most projects the efforts put into preparing the concrete floor before actually painting will ensure that the paint adheres, is smooth and will last for many years. 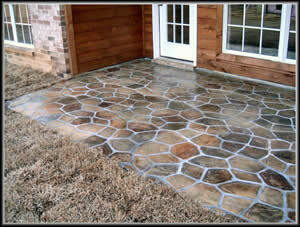 Paving bricks have become a very popular addition to many landscaping projects. Made by molding concrete in forms, the pavers come in a variety of textures, colors, shapes, and sizes providing the ability to match and compliment brick and stone veneers used elsewhere on adjacent buildings. Installing pavers and concrete stones has come a long way since they were introduced. It is no longer necessary to have a bland pattern. Because the installation of paving bricks is a complex and time consuming procedure many do it yourselfers do not invest in the effort to do the job right – the first time. If proper installation is not followed, the pavers will heave in some spots, settle in others and spread out producing an unsightly outcome. Paving bricks and concrete stones that are installed as driveways, walkways or patios can sink and heave over periods of time. Installing pavers and concrete stones has come a long way since they were introduced. 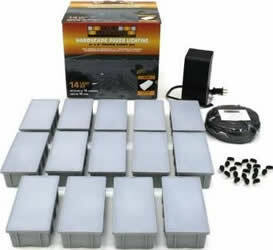 Many companies have introduced low voltage lighting pavers which can be integrated into many paver or concrete stone designs. In order to prevent washout and to provide better protection against the germination of weeds and grasses manufactures have begun to add polymers to the silica sand, creating polymeric sand . 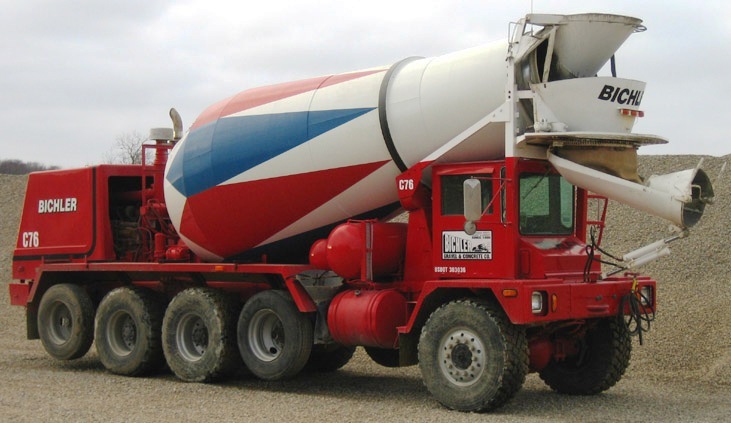 Questions and answers about the proper use and care of concrete. If you are installing a concrete garage floor, patio, driveway, sidewalk or support columns you should consider using reinforcing bars or as they are termed in the industry rebar , throughout the slab. 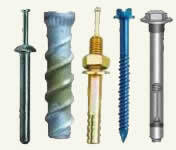 Reinforcing bars help to hold the concrete together and will prevent cracks from forming. 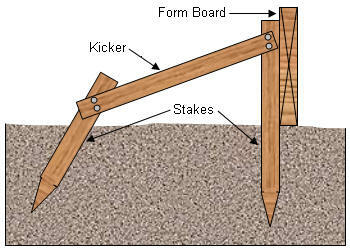 The sill plate is the first piece of lumber that is attached to a masonry foundation. It is a critical part of the structural integrity of a building. Whenever there is a transition from a masonry foundation to a wood structure, a house, addition or garage a sill plate must be installed. There are many ways to finish concrete. One can install a surface on top of the concrete such as ceramic or porcelain tile, hardwood, bamboo, cork, laminate or carpeting. Specially formulated concrete paints are also available. 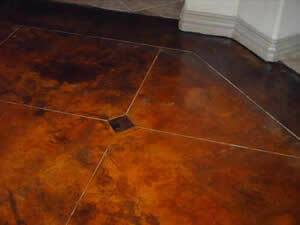 There is however a relatively new technique available for finishing concrete and that is staining. Many DIY handymen believe that when concrete is poured into a form, be it a tube for a footing, a rectangle or square, the first impression is that the concrete will fill any and all voids in the form. This is incorrect.